This new edition of the bestselling Measurement, Instrumentation, and Sensors Handbook brings together all aspects of the design and implementation of measurement, instrumentation, and sensors. Reflecting the current state of the art, it describes the use of instruments and techniques for performing practical measurements in engineering, physics, chemistry, and the life sciences; explains sensors and the associated hardware and software; and discusses processing systems, automatic data acquisition, reduction and analysis, operation characteristics, accuracy, errors, calibrations, and the incorporation of standards for control purposes. 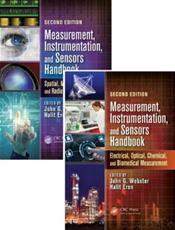 ... A concise and useful reference for engineers, scientists, academic faculty, students, designers, managers, and industry professionals involved in instrumentation and measurement research and development, Measurement, Instrumentation, and Sensors Handbook, Second Edition provides readers with a greater understanding of advanced applications.